Drexel LeBow students attending a talk by a television executive and LeBow graduate received an unusual business case lesson. As Christine Dorfler, CFO for NBCUniversal’s local news operations, related it: Clips of “The Tonight Show with Jimmy Fallon,” the latest version of a long-running NBC staple, are incredibly popular on Youtube. “Do you know how much we make from those clips?” she asked, then held up her hand in the shape of a “zero” shape. While delivering career advice and high-level perspectives on the media industry as part of a Lunch, Learn and Lead presented by Drexel Women in Business, Dorfler also illustrated the importance of reaching audiences online and of building the brands of the show and its host – even if it results in a missed opportunity for revenue. Dorfler, a LeBow Online MBA graduate, went into military service in the US Army after college, followed by a rotational program at GE, and increasing levels of responsibility at NBCUniversal leading up to the company’s purchase by Comcast in 2011. Throughout her talk, Dorfler was forthright about disruption in her industry and the challenges she faces. She provided a survey of the media landscape, including all of the channels and products under Comcast NBCUniversal, and shared the company’s market share and track record of growth, including what she calls “a great run of profitability” dating back to before the Comcast acquisition in 2011. During a wide-ranging Q&A session, two questions came from students that are on familiar territory for Dorfler: A current online MBA student and a senior about to enter Comcast’s CORE rotation program. Mirela Hima, a senior majoring in Accounting and Marketing, said she was personally very inspired by Dorfler’s presentation, noting that part of Dorfler’s military career was spent in Albania, Hima’s home country. “What I learned from her experience is that as long as you are passionate about what you want to achieve in your career and you work hard for it, you will always find a way to adapt even if you come from a completely different background,” Hima says. 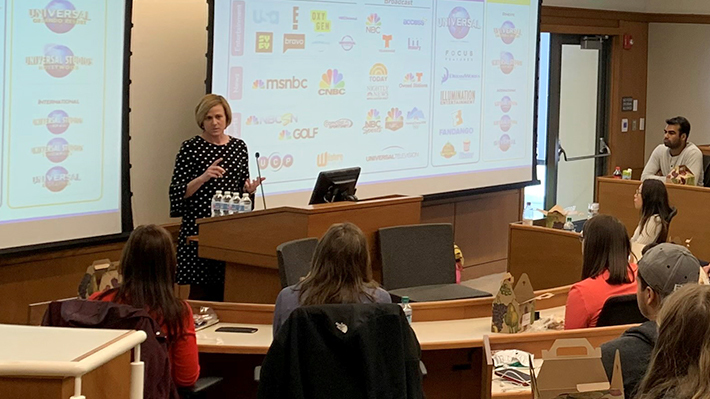 A senior Comcast executive gave Drexel LeBow DBA students an overview of business challenges across all industries confronting technological changes. Sarah Malik’s paper, co-authored with Professor of MIS Murugan Anandarajan, looks at securing medical devices that use Internet of Things technology. This newly created fellowship supports the engagement of a graduate assistant to help with a variety of research projects for one year. Thursday, April 25, 5:30 – 7:30 p.m.